What is a Sales Agreement?A Sales Agreement is a detailed contract outlining the terms of sale of goods and services to a third party. What is the difference between a Sales Agreement and a Bill of Sale?A Sales Agreement is a detailed sales contract. It is commonly used when selling new goods and services or items that require delivery. In contrast, a Bill of Sale is a simple contract that is used to provide evidence that goods have been sold. It is commonly used for straightforward transactions, such as when selling a used vehicle.Why can't I use a Sales Agreement for a real estate transaction?There are a specific set of rules you must follow when selling real estate. Use our Real Estate Purchase Agreement when transferring real estate. The Buyer will accept the Goods and pay for the Goods with the sum of ________________________ ($0) USD, paid by cash as required in clause 4 of this Agreement. The Seller and the Buyer both acknowledge the sufficiency of this consideration. In addition to the purchase price specified in this Agreement, the amount of any present or future sales, use, excise or similar tax applicable to the sale of the Goods will be paid by the Buyer, or alternatively, the Buyer will provide the Seller with a tax exemption certificate acceptable to the applicable taxing authorities. The Buyer will make payment for the Goods at the time when, and at the place where, the Goods are received by the Buyer or, in the alternative, when any document of title or registrable bill of sale, bearing any necessary endorsement, is tendered to the Buyer. The Goods will be deemed received by the Buyer when delivered to the Buyer at ________________________________________________________________________________. The method of shipment will be within the discretion of the Buyer. However, the Seller will only be responsible for the lesser of truck freight or rail freight to the Buyer. Risk of loss will be on the Buyer from the time of delivery to the carrier. The Buyer will provide, at its expense, insurance on the Goods insuring the Seller's and the Buyer's interest as they appear, until payment in full to the Seller. THE GOODS ARE SOLD 'AS IS' AND THE SELLER EXPRESSLY DISCLAIMS ALL WARRANTIES, WHETHER EXPRESS OR IMPLIED, INCLUDING BUT NOT LIMITED TO, ANY IMPLIED WARRANTY OF MERCHANTABILITY OR FITNESS FOR A PARTICULAR PURPOSE. The Seller does not assume, or authorize any other person to assume on the behalf of the Seller, any liability in connection with the sale of the Goods. The Seller's above disclaimer of warranties does not, in any way, affect the terms of any applicable warranties from the manufacturer of the Goods. The Buyer has been given the opportunity to inspect the Goods or to have it inspected and the Buyer has accepted the Goods in its existing condition. Further, the Seller disclaims any warranty as to the condition of the Goods. Title to the Goods will remain with the Seller until delivery and actual receipt of the Goods by the Buyer or, in the alternative, the Seller delivers a document of title or registrable Bill of Sale of the Goods, bearing any necessary endorsement, to the Buyer. The Seller retains a security interest in the Goods until paid in full. Inspection will be made by the Buyer at the time and place of delivery. The Buyer's failure to give notice of any claim within 10 days from the date of delivery will constitute an unqualified acceptance of the Goods and a waiver by the Buyer of all claims with respect to the Goods. The Buyer's exclusive remedy and the Seller's limit of liability for any and all losses or damages resulting from defective goods or from any other cause will be for the purchase price of the particular delivery with respect to which losses or damages are claimed, plus any transportation charges actually paid by the Buyer. Except where otherwise stated in this Agreement, all terms employed in this Agreement will have the same definition as set forth in the Uniform Commercial Code in effect in the Commonwealth of Virginia on the date of execution of this Agreement. IN WITNESS WHEREOF the parties have executed this Sales Agreement on this _____ day of _____________, 20____. A Sales Agreement, also known as a Sales Contract or Sales of Goods Contract, is used to specify the terms of a transaction between two parties. What can I use a Sales Agreement for? When creating your Sales Agreement, clearly describe the item and/or service. This should include a physical description and the quantity being sold. Who are the parties in a Sales Agreement? How do I determine the payment details in this Sales Agreement? The seller should provide a receipt to the buyer for transactions involving cash. Deposit is a specified amount of money that a buyer gives to a seller as security that they will follow through on the transaction. If the buyer chooses to purchase, the deposit will go towards the purchase price. The deposit can be refundable or nonrefundable, meaning that either the deposit is returned to the buyer or kept by the seller if the deal does not go through. It is important to include payment due dates for both the payment itself as well as the deposit in the Sales Agreement, if applicable, to make the transaction details clear. Will the goods be delivered? You may wish to include terms regarding where the goods will be delivered. This can be at the buyer's address, the seller's address, or at another specified location. The seller can be compensated after the buyer has received the goods, the seller has shipped them, or a Bill of Sale has been created. What's the difference between a Sales Agreement and a Bill of Sale? While a Sales Agreement and Bill of Sale have similar purposes, a Sales Agreement offers a more detailed payment plan and provides warranties on the item. It also allows both parties more flexibility prior to completing the agreement by arranging terms to secure goods before they are purchased. A Bill of Sale is a form evidencing that an item's ownership has been transferred from one party to another. It can be used as part of a Sales Agreement to prove that the goods officially changed hands. What do the terms liability, warranty, and "as is" mean in a Sales Agreement? Warranty refers to the guarantee that a seller makes about the quality and condition of goods. They own it (e.g. the seller purchased the car from a dealership). The item has no claims or loans against it (e.g. there are no outstanding liens or payments on a vehicle). The goods are fit for use (e.g. the motorcycle is fit for driving). The item does not infringe on patents or trademarks (e.g. the seller's invention is not a replica of someone else's patented design). "As is" refers to when a seller offers no warranties on an item, which means they do not guarantee the quality of the goods to the buyer, and the buyer agrees. This condition only works if the seller has not purposely hidden any flaws. 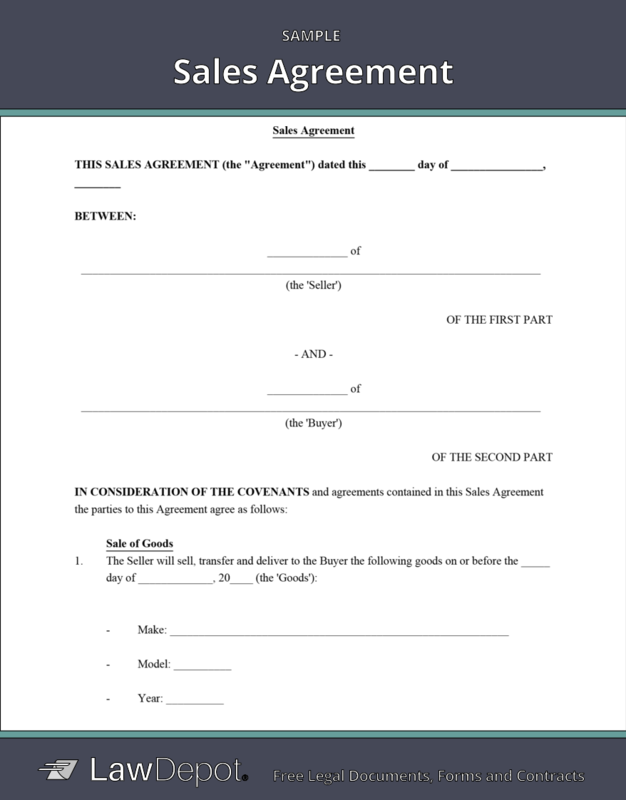 Personalize your Sales Agreement template.